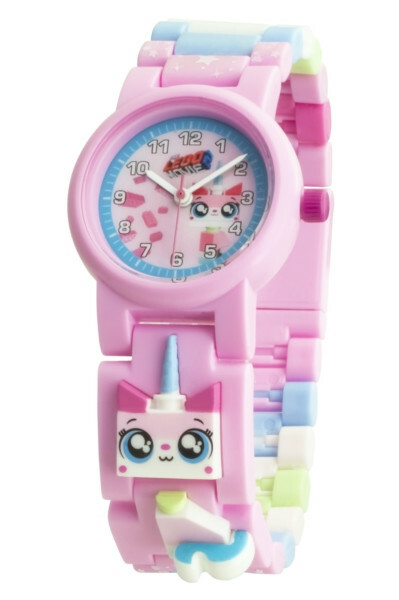 It’s time to transform yourself with your LEGO® Movie 2 Unikitty Minifigure Link Buildable Watch! Unikitty is the half unicorn, half anime kitten who lives in Cloud Cuckoo Land. Unikitty is full of happiness and positivity and will do anything to help those close to her, especially the leader of her group Emmet. Despite her upbeat personality, Unikitty can be short tempered and must remind herself to Stay Positive! LEGO® Movie 2 sees her transform into her newest alter ego, the roaring, fighting machine Ultra Katty! The LEGO® Movie 2 Unikitty analogue watch comes with multi-coloured interchangeable links and endless design possibilities. Your newest companion can travel with you on your missions to protect the LEGO® Universe with a Unikitty minifigure link built into your watch strap.